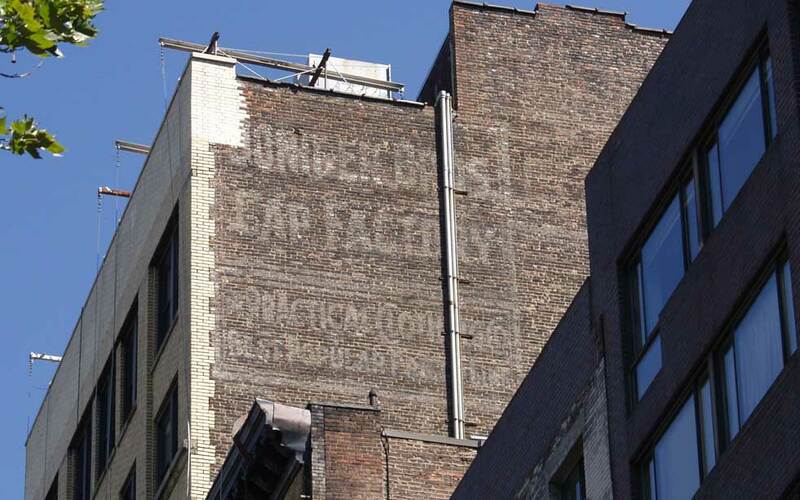 The Doniger Bros. Cap Factory was located at 663 Broadway from 1912 to 1922. Their sign is located at the back end of the building which runs through the block and has the address 230 Mercer St. at this end. The firm Doniger Bros. was in business from 1894 to 1942, and traced its origins to 1889, when one of the brothers, Jacob Doniger, was in business on Bleecker St. as a cap and hat manufacturer. The original brothers were Jacob Doniger (1867-1920/21), Henry Doniger (ca. 1872-1928?) and David Daniel Doniger (1874-1949). Jacob, Henry and David Doniger were three of the several sons of the pater familias of this clan, William Doniger (1846?-1900s). William Doniger is found in the 1900 U. S. Census living at 27 E. 4th St., Manhattan. He lived with his wife, Bella, and 9 of their 11 children, who included David, age 25, Isaac, 21, Joseph, 18, and Sundel, age 10. William, David, Isaac and Joseph Doniger all have "cap trimming" as their occupation. All are recorded as born in Germany, although other sources indicate that their European origin was Suwalki, Poland/Russia. Suwalki is currently (2013) located in northeastern Poland close to the border with Lithuania. In the 1860/70s this area would have been under the control of the Russian Empire. By the time of the 1910 U. S. Census Bella Doniger was a widow and lived in the Bronx with 6 of her 11 children, including Isaac, age 31, and Moses, age 25, whose occupations were recorded as "Salesman, Wholesale Caps." Jacob, Henry and David Doniger were now married and had their own homes. David Doniger lived in Manhattan, and Henry and Jacob Doniger had homes in Spring Valley, Clarkstown Township, Rockland County, NY. Trow's Copartnership Directory for New York in 1914 continued to list Jacob, Henry and David Doniger as members of Doniger Bros., although the Polk 1915 New York City Directory added their brother, Isaac Doniger, as another member of the company. The most prominent of the Doniger brothers was David Doniger, who formed his own company, David D. Doniger & Co. in 1921. Doniger & Co. specialized initially in imported caps and hats, and later expanded to sportswear. The following is from David Doniger's obituary (New York Times, 5 Dec. 1949), "David D. Doniger, who helped popularize sportswear in the United States and later American sportswear throughout the world, died yesterday of a heart attack in his home, 101 Central Avenue, Lawrence, L. I. He was 74 years old. Born in England, Mr. Doniger came to this country at the age of 13. He had little formal education and worked on newspapers in Detroit until he was 17, when he joined the firm of Doniger Brothers, in this city, one of the largest concerns in this country manufacturing hats and caps. During the first World War he served as a consultant to the Government on textiles. After leaving Doniger Brothers in 1919 he traveled in Europe for two years. On his return to the United States Mr. Doniger established the firm of David D. Doniger & Co., 303 Fifth Avenue, manufacturers of McGregor sportswear, and became its president. Eventually he established factories, most of them in New Jersey. The firm also maintains agencies in fifty-four foreign nations. ... " That he was born in England seems to be pure fiction. His naturalization petition (3 June 1902) includes "Former Nationality: Russian," and a passport application (26 April 1920) states "born 15 May 1874, Suwalki, Russia." Prior to 663 Broadway, Doniger Bros. were located nearby on the top two floors at 21-29 W. 4th St. A fire in this building the night of 24 August 1906 put them out of business temporarily. This advertisement for Doniger Bros. appeared in Men's Wear, vol. 21, no. 12, 24 October 1906. This ad for David D. Doniger & Co. appeared in The American Hatter, vol. 50, no. 9, April 1921. Another Doniger enterprise was the Crown Point Spar Co., a mining operation in Essex County in upstate New York. The website mindat.org locates Crown Point on Lake Champlain north of Ticonderoga. David Doniger was listed as president of the Crown Point Spar Co. in the years 1915 to 1925. The mineral called pegmatite mined at Crown Point was used for roofing spar and for several other purposes, including manufacturing enamel ware. This ad from 1922 suggests it be used to coat building materials to give them a granite-like appearance. Yet another of the Doniger brothers was Sundel Doniger (1887-1972). He was another son of William Doniger and was found, age 10, in the 1900 U. S. Census living with the family at 27 E. 4th St., Manhattan. He was born in Suwalki, Russia, and became a naturalized citizen in 1909. In the mid 1910s he was a member of Doniger & Co., an import/export business whose president was his older brother, Joseph Doniger (1881-?). In the 1918 New York city directory the business of Doniger & Co. was described as "Surgical Instruments, Brushes, Druggists' Sundries, Laboratory Apparatus." Sundel Doniger registered for the World War I draft in 1917 when he identified himself as a dealer in surgical instruments, S. Doniger & Co., 164 5th Ave., New York City. S. Doniger & Co. were listed in the Manhattan telephone directory from 1924 to 1936, then became the Crescent Surgical Sales Co. until they closed for business after 1953. The sign for Practical Clothing Co. seems to read, "Best Popular Priced Line." The Practical Clothing Co. were clothing manufacturers located here from approximately 1912 to 1929. The original proprietors were David Levine (1877-1942) and Philip Cedar (1873-1952). These two were in business earlier as Levine & Cedar, clothing manufacturers, located originally nearby at 682-684 Broadway. Levine & Cedar was formed around 1907, and moved in 1912 to 663 Broadway. At that time the firm name was changed to the Practical Clothing Specialty Co.. This remained the name until 1915 when it was shortened to Practical Clothing Co. This was also when David Levine left the partnership, and Philip Cedar took as his new partner, another Russian immigrant, Max M. Friedman (c.1886-1952). All three of these figures had prior business experience before these partnerships. David Levine was in business with Julius Shapiro as Levine & Shapiro, clothing, at 736 Broadway in 1905. Philip Cedar manufactured clothing with his brothers, Hyman Cedar and Sol C. Cedar, as Philip Cedar & Co. and then as Cedar Bros. from 1899 until 1907. Max Friedman was in business with his brother, Jacob Friedman, at J. Friedman & Co., clothing manufacturers, at 708 Broadway from as early as 1908. In 1918 Philip Cedar registered for the World War I draft when he lived at 1440 50th st., Brooklyn. He was 41 years old and said that he was born 20 May 1873 in Russia. His occupation was "merchant, Practical Clothing Co., 663-5 Broadway, New York, NY." In the 1940 U. S. Census Max Friedman lived at 858 E. 26th St., Brooklyn. He was 54 years old and his occupation was "executive, manufacturing clothing." David Levine had a varied career in silks and in garment manufacture after his partnership with Philip Cedar. He registered for the draft in 1918 when his occupation was "silk business, Levine & Shevell Co. Inc. 432 4th Ave." That same year he was recorded in the Directory of Directors in the City of New York as "Pres., Treas. and Dir., D. L. & W. Inc., 830 Broadway." D. L. & W. manufactured men's clothing. W. was Simon C. Weil, from Boston, Mass. In this same year both he and Simon C. Weil were recorded as officers at the Imperial Clothing Specialty Co., 46 E. 14th St. In 1920 Levine was president of Canton Silk Mills, 63 Madison Ave. In 1925 he was president of the Best Ever Costume Co., 16 W. 22nd St. His entry in the 1940 U. S. Census gave no occupation. Maybe at age 62 he was retired. In 1913 the annual register of factories compiled by the New York State Dept. of Labor recorded Levine & Cedar at 663-665 Broadway with a work force of 29. In 1933 Practical Clothing Corp., Max M. Friedman, pres-treas, was located at 912 Broadway, 4th floor. Practical Clothing Co. (including its predecessor, Levine & Cedar) were in business from 1907 to 1953. The business left 663 Broadway in 1929, had several locations nearby, then were located at 912 Broadway (near 21st St.) from 1932 to 1949.